*1 – From the inline text adverts comparison. This is one of those affiliates who don’t use a network for their affiliate program, I don’t normally use individual sites but at one stage I was crazily getting a fair amount of traffic for the daft tattoo sleeves, so I joined the program and automatically convert their links to affiliate ones which for the sake of 10 minutes work was certainly worth it. I made more from affiliate sales from my own blog ads experiment then I did from blog ads advertisers, so so I reckon some advertisers got a bit of a bargain here. I only started messing with one product on Click Bank in November, I’ll do a full case study on this in a future post. This was a steady performer and as my traffic was up in December so was their CPM income. This is an area that I could certainly improve by selling the space privately rather than through the network. My 3 TF ad units combined have a Net CPM of less than a dollar which is absolute crap so I will be remedying this. I still like Chitika, their RP units were my best performer but Chitika Lynx was also good. My two best affiliates with CJ were Think Geek and Hammacher both sell products that I’ll write about anyway and getting paid for them is an obvious bonus. I wrote various gift guides to push sales and learnt a lot about what products sell (guess what I’ll be pushing next year). I did quite a bit of experimenting with Amazon and they managed to just scrape into second place. During December we sold 2,414 products valued at $158,114.97 taking us to the 8.25% commission tier. The one downside is I sold a lot of electrical products (gadgets so expected) which only pay a commission of 4%, still I’m not complaining. I took Adsense off my affiliate pages, I pushed affiliates as much as possible but yet again Adsense continues to amaze me making up nearly 50% of the sites income, $30,334.66, thank you Google. I had my first $1,000 Adsense day in November and they continued right up to just before Christmas and peaked at just under $1,500. I think I can safely say that Adsense works pretty well in my niche, Google still didn’t send me a present mind, though they did send me a card and I’m quite looking forward to the EFT off them at the end of the month 🙂 . At the moment I don’t use any PPC or paid marketing, all traffic is organic from search engines, subscribers and natural links from related sites. My expenses are a dedicated server (~$350 per month) and a great team of 4 paid writers who are paid on a per post basis which amounts to under $3,000 per month, though they will be getting a surprise bonus 🙂 . On 22nd September 2004 I earned $0.82 from Adsense, after a lot of hard work, ups & downs and earning by learning I’m able to write this post. If you’re just starting out on your online adventure I hope you find this post inspiring, with effort the sky is the limit to what you can earn. I said I’d give $100 to anybody that could guess the order of my revenue streams. The closest was probably David who got 2 out of the top 3, but there’s no prizes for closest (other than the link I suppose) so the $100 is off to charity. Which charity gets the $100? It will be going to Celiac Disease, I’m a friend of Alek’s and generally send donations like this there. Total is over $25,000 for Celiac Disease Research using … (go figure!) … Christmas Lights. P.S. If you want to read a crazy/cool story: the burrito reindeer raises $1,000 for Celiac Disease. I find your post and revenue number very encouraging. It gives me a boost to perform better and with more enthu. That makes for awesome reading Al, $158,114.97 just through Amazon is fantastic & leaves a lot of room for making even more through affiliates in the future. That lot at Amazon certainly know how to convert traffic. Congratulations. That’s some hefty earning there! Have you seen a decrease in earnings after the christmas period with Adsense? I have seen a slight decrease in earnings since the christmas week, but traffic is going up still which is always good. Traffic actually dropped the christmas week which was no suprise, but yesterday and today traffic returned higher then prior to christmas. Hi Matthew, at the moment my traffic and earnings are down to about October levels so congrats on continuing to grow. I reckon next week we’ll be able to have a better idea of where we are as there are still a fair few holidays going on. I cant wait to the end of Jan to see how my stats look. This time last year GV took a severe nose dive in traffic which took a few months to recover from. I experienced a similar thing last year where I lost all rankings due to server downtime, fortunately they back after around a week. Funny thing is I added SSL to the admin section of the site yesterday which meant the site was unavailable for an hour or so (had to change IP and DNS) so I’m really hoping not to be bitten again. This is a lot of money for a niche where people know how ads look, and usually don’t click to often. I totally agree and I expect very few clicks from regular readers. I expect what happens is that less techy people are searching for gifts at this time of year, they find the site and then there is a fair chance of the click. I also find Adsense on CG is especially well targeted (as it should be really). I was reading the other day on the BBC website (can not find it now) that Amazon where shipping 750,000 orders a day in the build-up to Christmas …something we should all look into for next year the brand and conversion is just unbeatable. That’s an insane number of orders, there’s a lot to be learnt from them guys. Congrats on your success. I wonder if you could speak about how you went about finding and retaining writers. I know, in my experience, the process can be quite aggravating. Hi handsome Rob, check out this post I did on finding paid writers. Thanks for sharing. Your adsense earnings amaze me. I would think that most of your visitors were kind of techie and wouldn’t click on them. Great Job. They amaze me too Joey,especially when I was concentrating more on other streams. Michael (above) has a similar point about techies clicking which I commented on aboe for what it’s worth. Al …do you want to share with us, how a 60k/month man thinks, and how is a day in his life ? This might be a post idea. The $60K is more the exception than the rule, I generally generate about ~30k. To be honest a day in the life would probably make a boring post though I will admit as my income has increased I do think differently about opportunities, there could certainly be a post in that. Al, do you send your Adsense EFT to your business or personal account? And what is the tax rate for your income levels in your contry? Thanks Al. Then it’s similar to Slovenia where tax rate for this kind of income is 41% for a person and 22% for business. Very inspiring indeed. I think I’ve now started to settle on a niche which has, for me, several online and offline opportunities. If I make that sort of income in a year I’ll be well pleased, let alone a single month. Great work though Al, well deserved. I’ll look forward to hearing and seeing them Garry, I’m still missing a good offline business so that is something I’m also looking for, though online earning does seem the way to go at the moment IMO. Any thoughts on improvements? (and be sure to visit through the links so I can earn a commission 😉 Will see if this gets me on my way to my current goal of $1/mo by end of June. I’m excited that the new year brings fresh posts — I’ve got some SMM catching up to do. Man i love your blog.Keep it up .Hopefully i will earn that income someday.Maybe tomorrow 🙂 . Dang, well done lol! What are the primary sites that you run other than this blog and the tattoo site that I’ve seen you mention in other posts? Either way, congrats on the December results. Unfortunately my income declined for Adsense has been slowly declining. Congratulations. Hey you should check us out here at LinkWorth to help further increase your revenue for 2008. Let me know if you have any questions. These post inspire me to push on. Good job! Where did you find your writers? And can you please share a site that they write for you? Great work, Al. Congratulations on the nice windfall. May 2008 be another great year for you. WOW, It’s awesome! Congrats! Adsense is pretty good on your CG. Your revenue graphs like that $130,000 check in my eye. I think it still have a large space to increase. 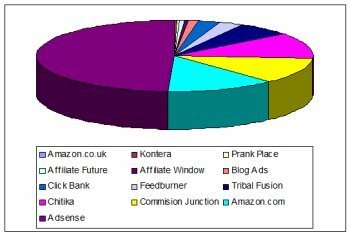 I had a really good christmas with my sites, Amazon worked really well for me, and its helped to motivate me again and realise what I can achieve in affiliate marketing. Also wishing you congratulations…looks like Adsense is really paying off for you. Unfortuantely in my niche the earnings per click are so low that it’s not worth placing on my site. Would rather have people go over to a site that can help me earn a substantial commission. Very inspiring post. I’m about half way to my goal of giving up my full-time job, making money from a mixture of adsense content, domain sales and domain parking. Your experiences make me feel it is definitely something I can achieve to set up full-time on my own. How much traffic did coolest-gadgets get in December? Congrats, i see that adsense generat eyou most income, what other lbogs do u have also?? What are your reviews of CJ. I just registered with them to be an affiliate for godaddy and they’ve been pretty slow. Also what’s the best way to make the most out of them? Hey I love how you can put your name AND you title in your comments. What plugin do you use? forgot to ask. What’s your gadget blog? Have you ever tried ShareaSale on CG? I wasn’t crazy about it at first, but they make it incredibly easy to create custom links for individual products, so it’s worked out really well for a shipping site I have. Could you be talked into doing a similar post about the Christmas of 2008? I really find your blog venture to be extremely inspiring so I would really like to know more about it. Also I haven’t noticed until now that you write that you have other things in your portfolio. Would you care to share a little about what that is? I love these posts and I really miss them. I want to hear about how CG has fared lately. In particular the Christmas 2008 season. Wow this is a great site, very inspirational I have to say. My journey has not being going for long but with those figures dangled as the preverbial carrott I am going to be spening alot more time on my ‘part time’ websites.